The Daily Dimwit: Christmas Money Spent! Well folks, I got some money for Christmas and I blew it at the card shop! Surprised? Another Sutter auto to my collection. 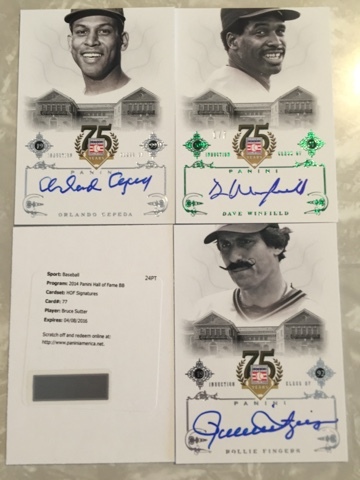 Not too shabby on the Fingers and the Cepeda base autos. The highlight of course is the Winfield auto numbered 1/7! Got a bunch of base cards and parallels if anyone is looking to fill set needs! 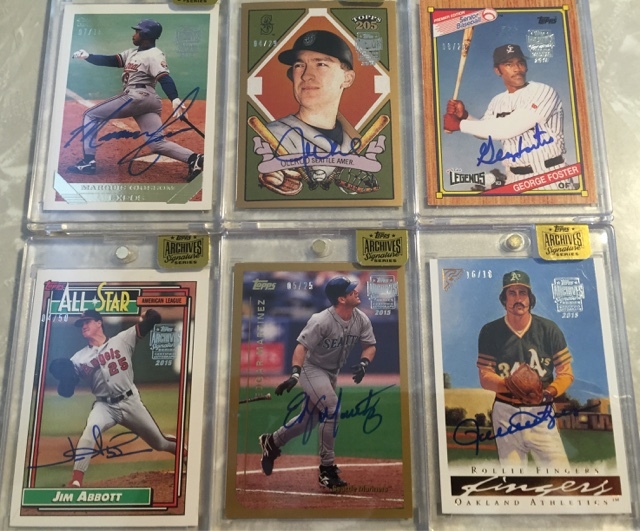 Grissom, Olerud, Foster, Abbott, Martinez and Fingers... I put those in my rankings of worst to best. Apparently it was my day for Rollie Fingers autos! All for trade. Thanks to the various relatives who made this possible! I like your Panini HOF cards! Please let me know if I can get the Abbott from you, I've been thinking about chasing those. I'd never actually bust any boxes of the stuff... but I actually really like the 2015 Topps Archives Signature cards. Congratulations on pulling that SWEET Randy Johnson! If you've got any Mazeroski's to spare from the HOF set, please let me know. Some good names there and that Randy Johnson is amazing!